My father loved his cars and nursed his Jaguars like they were babies. He polished them inside and out and tweaked engines until they sounded perfect to him. Before joining the Licensed Trade, he was an engineer for many years and still liked to involve himself in machinery. Wherever we lived, he always had a meticulous work-shop set up. I was very much a ‘daddy’s girl’. Wherever he was, I was, as much as possible. That would usually be down the pub cellar, in the garage, work-shop or in the car park. I inherited his fondness for cars. I had a cherry-red Tri-Ang convertible, my favourite colour at the time. I copied my dad. I polished the bonnet until it gleamed and tapped the tyres. My car didn’t have the twiddly, interlocking bits that make an engine and it didn’t need the smelly liquid that Dad poured down a funnel into something under his car bonnet. I could get it going very fast round the car park and I didn’t scuff my shoes that much, despite what my mum said. I had that little red car until I grew out of it. 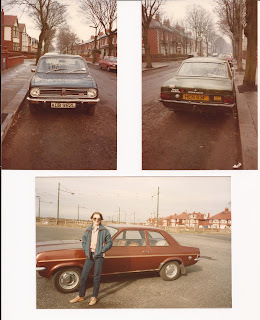 Dad bought me my first real car when I was seventeen. It was an Austin A40. His choice, not mine. I would have gone for an emerald green convertible Ford Capri. Anyway, his choice for me was perfect and for sensible reasons like low mileage, and easy to manage. He taught me basic car care, checking oil, coolant, windscreen washer levels and tyre pressures. Some things were learnt through necessity, like how to remove, dry and replace spark plugs, how to liberally spray WD40 or similar and how to use jump leads. Driving was fun. I had my A40 for about five years and it served me well. 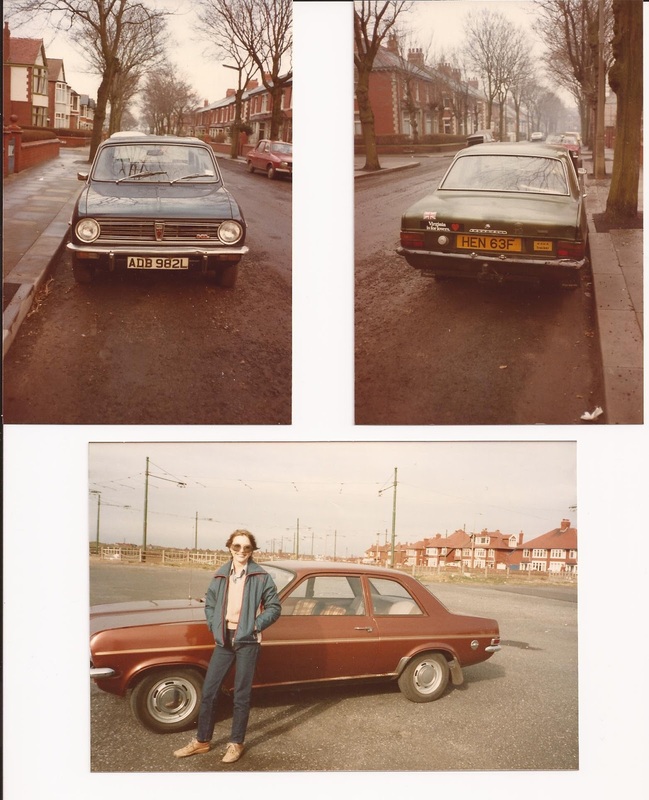 I only parted with it when my grandfather gave up driving and wanted me to have his nearly new, very low mileage Hillman Hunter. I think he’d only used it to take money from his pub to the bank and take my grandmother to Chorley Market once a fortnight. It was a lovely car and I kept it for a long time. It was the last of my decent cars for ages. One of my cars was at least fifty shades of green, which didn’t matter because if I wanted to cover up another blemish, any green would do. It only cost me £50, which was probably as much as I could afford at that time. I was driving along Garstang Road having turned off the A6 one night, yes,it’s always night time when something goes wrong, when the bonnet flew up. It scared me to death. The catch had broken off. I limped it home at no more than ten miles an hour, the bonnet down, but threatening to fly up again. By the time I sold that particular car, Dad had more or less replaced everything in the engine, piece by piece as each breakdown related to something else. I sold it for £50, the same as I’d paid for it. The person buying it wanted the number plate. Another car went ‘bang’ at the top of Crossley’s Bridge and rattled all the way down the other side, freewheeling. Reconditioned engine required. A car that I really liked, but turned out to be a very bad buy, used a great deal of oil and the repair would be more than the car was worth. At that time, I really wasn’t any good at buying a car on my own. I’ve had decent cars again since those lean times. I fell in love with the Nissan Micra when it first came out in the early 1980s and currently, I’m on my fourth. I haven’t owned anything else for thirty-odd years. Recently I handed over the keys to my sister who is more than happy to use it for me. I don’t like to drive unless I have to these days. The next car I buy, sometime quite soon, will be a Little Tikes Cozy Coupe and other things similar for my grandchildren to play with in our garden. It feels like I’ve come full circle. I’ll watch out for them scuffing their shoes. High time for one of my own poems. I wasn’t sure but Dad was keen. To buy a decent car for me. The A40 just had to be. Grandad’s car, his pride and joy. Now mine to care for and enjoy. A ‘Dark Side of the Moon’ delight. Let’s salute the Vauxhall Viva. Work for the MOT’s been done. It had stereo and looked cool. And it supped as much oil as fuel. How I love my Datsun Violet! It never, ever failed to start. ‘Til its bodywork fell apart. I’ve run them for thirty-plus years. Means Journey’s End – and lots of tears.